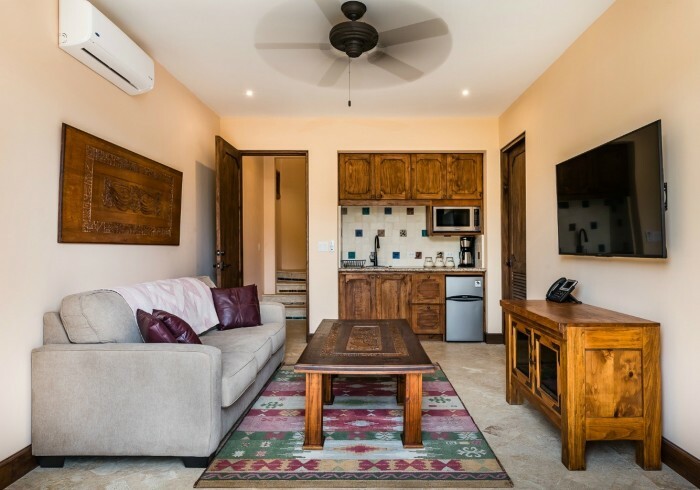 Few short-term rentals in Guanacaste have an atmosphere quite like Casa Maya’s Apartment, an ode to Mayan splendor that immerses you in this ancestral culture while offering modern comfort all the way. For the sophisticated traveler interested in Latin American culture and art, these cozy beach apartments in Las Catalinas offer a great lodging option just a short walk to the sea. Rich wood and soft salmon colors set the tone in the living room of this Costa Rican beach studio, featuring an integrated kitchenette, a full bathroom, and a pull-out sofa. The bedroom has a king bed, an additional pull-out bed, and an accessible bathroom. Fine Mayan textiles and decorations are featured throughout the studio. With its many different sleeping options, this lovely vacation studio makes great use of its space and its flexibility make it a favorite of families who want to make their best of their time together This beach studio for rent in Costa Rica accommodates up to six guests. Children are welcome. Embrace the comfort of a private beach apartment in a picturesque setting and experience the wonders of Costa Rica the way it’s meant to be. Enjoy the privacy and quiet of your own Guanacaste apartment with full daily housekeeping service and let our dedicated concierge team help plan your vacation in paradise is a resounding success.